Okay here is a photo of my male child whom my sister transformed into a female one..lol. Most of my friends and relatives are saying he looks better as a girl while some others are saying as a boy is better. Lmao. Please let me know what you and your fans think because I can't stop laughing. Latter on in life when he becomes a transsexual you'd start blaming the devil and disturbing God and the society. Lmao!! Nigerians! Tomorrow if the child grow up and decides to turn gay or transgender d parents will disown him.. not knowing dey instigated it in d child at a tender age. Please, we don't want another confused Onyx Godwin in Nigeria. Na so e dey start, remember that nigeria hv no room for transgender. Wake up now b4 u plant gaysm into ur child. I think he should have been a baby girl. Enough of this Chris Jenner, Onyx Godwin drama.. He look like boy nd his a boy gbam! Did u seek ur husband permission before u bring his son hia pls. I prefer him as a boy.. Dis is how it all start oo.. The boy will grow up now and the bruce jenner story will start again.. If d poor boy bcums bisi alimi nw, dey start swearing n cursing #idiot mother! Parents eh. 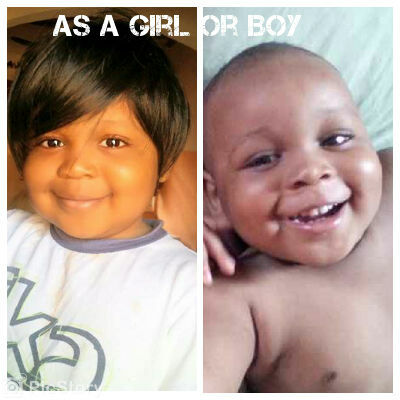 If this handsome child grows up and tell you he wants to become a woman, don't start binding and casting oh. na so gay & transgender they start....he looks adorable as a boy. Tomorrow when he becomes gay they will start blaming their "imaginary" enemies and village pple. Nonsense! in d world we currently live in.. this is brave and dangerous game u and ur sister r playing with this child. Parents will be using their hands to create issues. If he grows up to be a transgender/ gay, na una go first begin cry and caution him, whereas you unknowingly showed him the way as a toddler. Funnily enough, both. Can't choose. I prefer him as a boy. He looks like a todler he is. But d female transformation made him look older. Linda this is a useless point. What is the point they can put him back inside her tummy and make him come out again as a girl..... Your blog is beginning to loose regular visitors like people I know because of unimportant and unrelevant posts you put. Such a handsome and cute BOY. Chai! Looking very chubby and healthy. Pls take off that wig before he starts thinking like The likes of Bruce Jenner. Years ago, this would have been a very funny joke but these days, ife na eme! This is how it starts. Pls I beg of you, do not turn this boy into a fag. 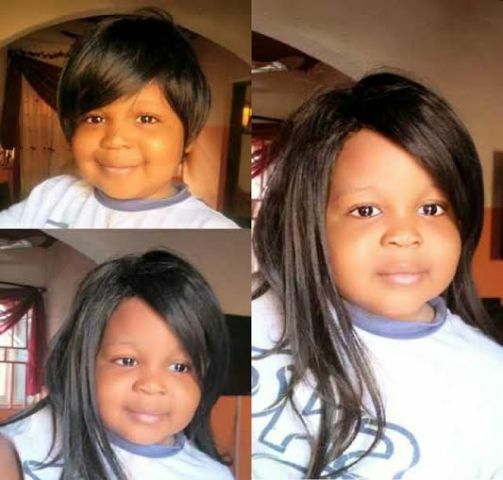 Firstly, I think it is just wicked to put a weave on a child male or female. Secondly, after doing this the parents of this child will not know why their child has an identity crisis? Shame on them for this. It is really unfair on the child. They clearly have nothing to do with their spare time. As a boy. The hair looks too artificial. This is how you put these stupid ideas into innocent kids.If he matures and starts wearing make up or begins to imagine that he is in the wrong body, who would you blame? Cute happy baby....your angel looks lovely either way mom. Ma'am please stop, before he becomes future derele.... who knew how derele's madness started. Starting him off on Bruce's path? Then wen he starts acting like Onyx or Bisi Alimi, u pple will say the witches from ur village are at work. Bye! He looks cute as both. I can't tell which is cutier. He looks cool in both. . .cos he's very well fed. Keep taking good kia of him owk buh don't fix such on him again to avoid being a mixed breed, d likes of. . .you know na!! !Linda complete d statement. . .d likes of. . .
That's when u let the boy start thinking he could transform himself to a female later in the future. I think he looks better as a boy. They should be dressing him like a girl, tomorrow of he decides to be a girl (gay) you would start to say it's your village people at work. Make una well done. Please tomorrow you should send him wearing a make up too. Joblessness at its peak. Chineke biko napu ekwensu ike. Either way, he is so cute. And funny-looking. Just like my 4 month old bobo too. Either way, he is so cute. And funny-looking. Just like my 4 month old bobo. 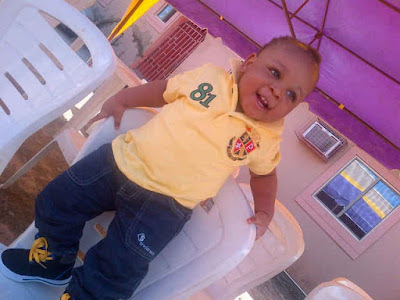 Make d mama stop dis cross dressing thing o b4 wetin dey worry Bruce Jenner begin worry dis poor child. I don talk my own. if the child starts swinging to the other side as he gets older. We shall know u caused it from here. Pictures dont lie!!! Interesting & adorable on one level. But on another level, u r just playing with fire. i don't know how informed u r, buy in this our new world of bi-sexual, transexual, gay & lesbian sensibilities u r inadvertently re-engineering ur child's sesibility. Something tells me u know what u r doing, though. Na so gay dey start. Idiots! U ask 4 a male child , God give u and now she dey ask us stupid questions ,Stupid woman . if he is gay tomorrow, you all will be pissed. he is a boy, don't take that away from him at this age. not funny! As a Boy, if I say he looks better as a girl, would you transform him to be a girl? As a Boy, if I say he looks better as a girl, would that transform him to be a girl? That's a wrong move, shey you want the child to be confused about his sexuallity from childhood as Bruce Jenner. That's how they start o later they will be running up and down that there male child is turning to a female. Shio to u Mrs mother. LWKMD, u re right o, na so the thing dey take start. Why are u trying to confuse your son at this tender age??? When u gave birth to him which organ did he come out with! If we all say he looks better as a gal what will u do about it? This is how you people go about making you kids gay. All I see is a cute handsome boy with amazing laughter. God created him a boi so he is a boy!!! Stop this nonsense already. In the next 10 years when your son 's friends gets hold of these photos off the Internet you will be the one crying "bullying". Second of all, confuse the boy about his gender well well oh. Ode mother. Raise a new Bruce Jenner. SMH. It was jst to create fun.. Why take it dis serious.. una wan poison everything with ur perverted mind..
Lol smh 4 you.how can you compare this innocent child to onyx. Lol. Pls don't give room for cross dressing ooo its risky oooooooo allow him be a dude oooo..ive said my piece!! My sister, same thing I said o.
I hope u will save this page for future purpose, so dat u can remember u are the real cause of ur sons problem. I pray that boy remains a boy, useless mummy. Must u put this on a social media? Lolzzzzzzzzzz, as God created him is dbest, and no other canb as best as dat. So BOY is d best. I like him better as a "girl"....lol. He's super cute though. God has given u a good boy. Why do you toy with his destiny. So many people are looking for either a boy or a girl. Any which way. The baby is still cute. Linda take note! I'm totally confused, are u speaking broken english?? It's for a child? been the girl? Or being a girl?